in a small EMC-compliant enclosure. 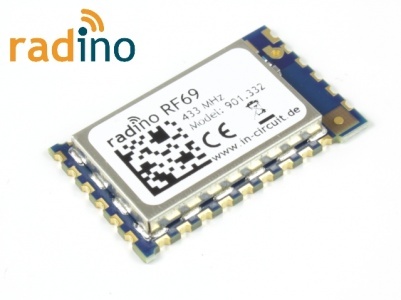 It is part of our family of pin-to-pin compatible radino Modules. Two modules are available for 433MHz and 868 MHz. in a small form factor, all pin-compatible to each other. Arduino Demo Applications available in our Library! Carrier board suitable for all radino modules. Includes Arduino connector for easy mounting of Arduino shields. Voltage regulator and Level-Shifters are also included. USB Stick for all radino modules. 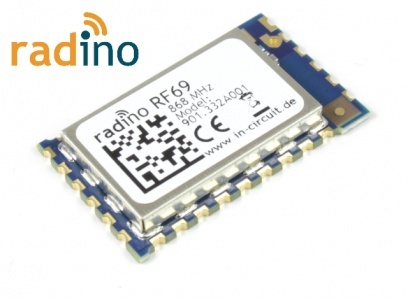 Available with integrated Chip-antennas and as a version with RP-SMA-connector. radino RS485-Bridge IP65 outdoor radio adapter for Modbus, Art-Net etc. Includes RS485 driver, RS232 driver, IP65 enclosure. 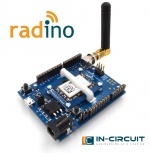 The core of radino is an Arduino Micro, so the programming is as easy as programming an Arduino Micro. 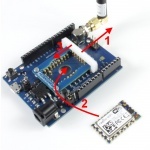 Visit radino/radino32 software for more information about the Arduino IDE and installation. For detailed information about our library for the Arduino IDE look at the radino Library documentation. 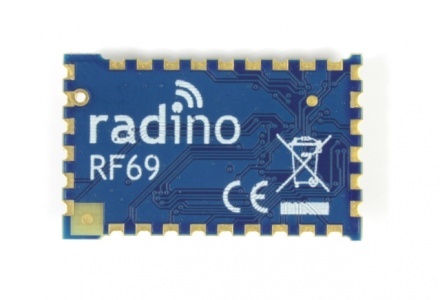 The Arduino IDE required follow includes for using the radino RF69. This page was last modified on 25 July 2017, at 11:34. This page has been accessed 34,493 times.